An innovative study to describe chronic disease risk in Tower Hamlets brought geographers and clinicians together. Cross-sectional geospatial analysis using electronic record data collected routinely in general practice, taking type 2 diabetes as the example. This 2011 study drew from electronic general practice records on all non-diabetic individuals aged 25-79 years in Tower Hamlets (n=163 275). This inner-city area has high socioeconomic and ethnic diversity plus a high prevalence of non-communicable diseases. Noble et al. used QDScore to calculate 10-year risk of developing type 2 diabetes and ArcGIS (specialist mapping software) to prepare visualisations of how these data varied by lower and middle super output area across the district. The maps were enriched with information on social determinants of health perceived within the area (population density, fast food outlets and green spaces). Usable data were obtained from 96.2% of the records. One in 11 adults in the cohort was at ‘high risk’ of developing type 2 diabetes (with a 20% or greater 10-year risk). Small-area geospatial mapping illustrated ‘hot spots’ where up to 17.3% of adults were at high risk. Ring maps allowed visualisation of high risk for type 2 diabetes by locality alongside putative social determinants in the same locality. Alongside technical challenges to downloading, cleaning and mapping data, robust information governance required both national and local consultation and agreement. Judgement was required to group data at the appropriate geographical level. It is possible to produce small-area geospatial maps of diabetes risk calculated from general practice data across a district-wide population. Collaborative working by geographers and public health clinicians allows presentation of findings in a way that is both accessible and engaging. Noble, D. et al. 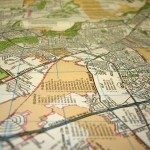 Feasibility study of geospatial mapping of chronic disease risk to inform public health commissioning. BMJ Open; 15 Feb 2012; 2(1): e000711.